Cub Pack, the heart of this modular storage system, are perfectly sized for kitchen support, dried goods, tools, camera gear, toiletries, even cloths. Strap “spare” Cub Pack to the drawer deck or secure them to a Front Runner Slimline II Rack. Customize your own storage configurations. Stack and secure luggage, Wolf Pack, Cub Pack, aluminum boxes and other storage containers to the top deck slide using Stratchits or other straps as well as Cargo Rail / 1150mm and Black Tie Down Rings. If you have any questions about whether or not this product will fit your vehicle, please contact Front Runner before purchase. The Drawer system has 3 different sized storage compartments all with rotating latches to secure drawers in place. Will the Roofnest 12v fridge fit into the fridge drawer? 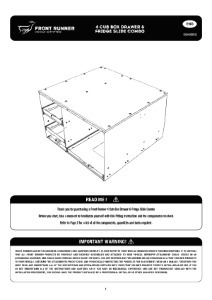 The dimensions of the fridge slide in the 4 Cub Box Drawer and Fridge Slide Combo is 508mm (20") W x 863.6mm (34") L x 546.1mm (21.5") H. As long as the fridge fits within these dimensions you should be fine! What is maximum size National Luna fridge will fit into the universal 4 CUB BOX DRAWER & FRIDGE SLIDE COMBO? The 90L National Luna will fit. Is it possible to access the spare tire with this installed in a Land Rover Discovery 4? Only our SSLD004 drawer system will allow access to the spare tire. Yes, it's a tight fit but it will work. Will this system fit the Dometic CFX 65? Yes, the CFX65 will absolutely fit perfectly. The 80L Engel is too big to fit into the slide. Is the drawer system easily removable? I.e. : in between trips? Removing from car? Definitely! The drawer can easily be removed. It’s only the initial fitment that takes a little time. Can u confirm the Height for the fridge space? The height is 56cm / 560mm.